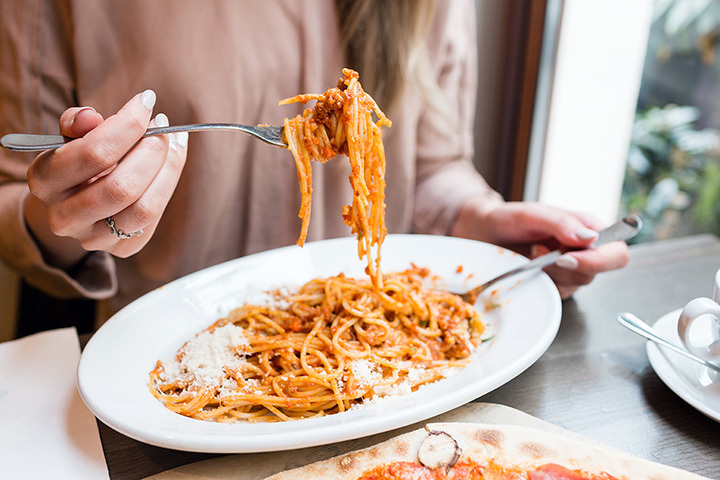 From squash-stuffed options to a traditional Bolognese, Michigan is serving up some seriously hearty options when it comes to pasta dishes. It doesn’t matter what you’re craving, you’ll find a delicious dish to suit your palate. Here are the 10 best pasta places in the state! The Pasta House in Kinde represents one of the Thumb Area's best options for pasta, largely due to its specialization in the field. Check out the seafood sacchettini or the housemade lasagna to check out all the different ways you can take pasta in Michigan. You can even build your own plates with different pastas and sauces. Rather stay out of pasta yourself? That's fine—the Pasta House accommodates with sandwiches, various Italian entrees, and soup and salad pairings. Head to Shelby Township and check out one of the punniest pasta joints around with Eataliana Homemade Pasta. With dine-in or take-out options, you'll have your choice of venues here, and of course, your choice of pasta dishes. Try one of seven different kinds of ravioli. Try one of 14 other kinds of pasta dishes. Try several different “rough pasta” options which are prepared and promptly blast-frozen to let you take them home and prepare them at your leisure. Whatever you try, you'll find pasta worth enjoying right here. Plymouth is home to the Cantoro Italian Market, sometimes called the “Disneyland” of Mediterranean food options. You'll not only be able to eat prepared pasta dishes here, but you'll also be able to buy pasta for later preparation yourself, along with a range of baked goods to go along with it. From gnocchi to tagliolini and beyond, you'll find it—and then some—waiting for you at the Cantoro Italian Market. You can even get non-pasta Mediterranean specialties like sea bass, filet mignon, and more. Marquette is home to the Pasta Shop, which offers a wide range of pasta dishes, with various meats, cheeses, and vegetables to satisfy most anyone's taste in pasta. Sandwiches, soups, salads, and desserts round out the menu, as does a slate of daily specials that provide some more intensive options. Wednesday is the Combo Plate, which features gnocchi, ravioli, and tortellini, with a side salad, for $10.50, which is a pretty fine plate at that. There are two great words that say “pasta joint,” and those two are “casual Italian.” That's just what Grand Rapids' Osteria Rossa seeks to provide, and man, does it do so. Having won a string of awards, from “Best New Restaurant 2015” to “#7 Best Italian Restaurant in Michigan,” Osteria Rossa is going to provide some pretty high-end casual Italian. From squash-stuffed agnolotti to squid-ink-based casarecci to more standard fair like rigatoni and spaghetti, you'll have plenty of pasta here to try, and that's before you even get into entrees like duck and trout. Giovanni's in Detroit comes with one great point in its favor: Frank Sinatra once ate here. If Sinatra eats somewhere, that's a pretty big deal. You can eat in, and eat where Sinatra once did, or you can get food to-go. It's not just about the famous connection, though, as you'll have an almost staggering range of options here. You can build your own—start with angel hair, linguine, tagliatelle or fettucine, and add one of four sauces: alfredo, bolognese, pomodoro and pesto al pomodoro—or get it pre-built in one of several dishes. Monelli's Italian Grill and Sports Bar is a comparatively recent addition, but one that's worth noting thanks to its range of options. Since it's a sports bar, it's got plenty of drinks, but as an Italian grill, it's got a lot of food options too. Try something familiar like fettucine alfredo or lasagna, or go off the beaten path to a cavatappi-based “Dirty Mac” or rigatoni carbonara. With locations in Livonia, Warren, Royal Oak, and more, the east side of Michigan can get a lot of life out of Andiamo. With house made pasta—from the simple lasagna bolognese to the more exotic frutti di mare with squid-ink pasta and several types of seafood—as well as imported varieties, you'll find plenty of options waiting for you here. Naturally, that's just the pasta; you'll be able to step up to a range of other options from salads to fish to chicken and beyond, making for just about any kind of pasta or non-pasta experience you could ask for. A restaurant named after a component of wine may not sound big for pasta, but for Tannin in Okemos, it's just part of the charm. Three words illustrate what you're in for here pasta-wise: “hand rolled gnocchi.” The hand-made carries on through the rest of the menu, offering up the simple—spaghetti in both Bolognese and carbonara sub-varieties—to some much more unusual fare like the lemon and chevre tortellini. Piada Italian Street Food makes the push for fast casual Italian food, which is something of a novelty as Italian goes. Check out three noteworthy pasta dishes: the basil pesto, the carbonara, and the diavolo. Step up from there into a range of other options from salads to piadas.